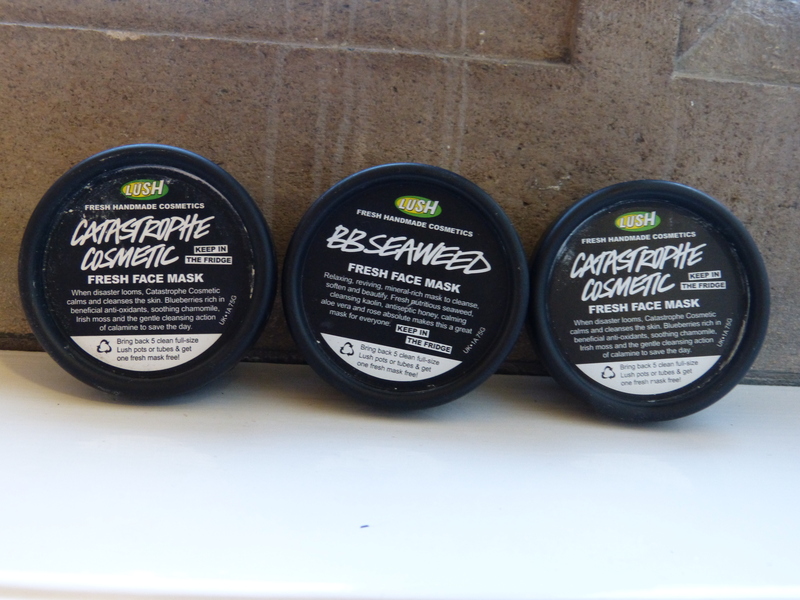 Okay, so first up, a couple of staples: my Lush face masks. I got through two Catastrophe Cosmetic masks, which is my HG, and a BB Seaweed, which I’m really not a fan of (hate the smell!). Shower gel! I decided this month to stop hoarding my Lush shower gels. I had lots of open bottles, and I got a bit fed up of looking at them, so I haven’t necessarily used the whole thing this month, but I have finally cut the stash down a bit! 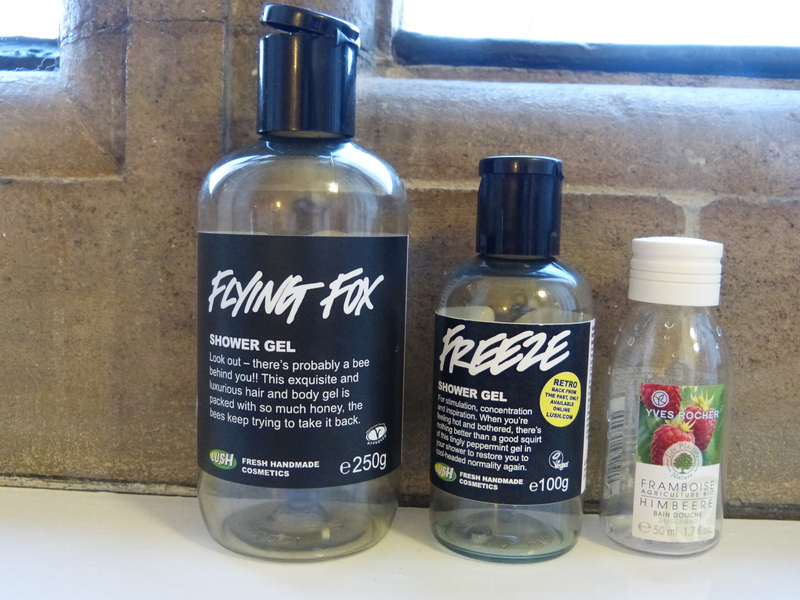 I finished a medium sized bottle of Flying Fox and a small bottle of Freeze, which are not my favourite scents from the brand. The jasmine in Flying Fox is a bit overpowering, and Freeze was disappointingly toothpaste-y and not like Ice Blue at all when it hit the water. Sad times. I did however love the Yves Rocher Raspberry shower gel that Luchessa sent me. It had such a beautiful smell! My one complaint would be that it was slightly too thin, and tended to escape from the bottle, but to be honest, I really don’t mind when it was such a lovely product! Body butter! This NSpa Vanilla Creme Brulee body cream is the penultimate one of this set of old-style NSpa creams I’ve been hoarding. 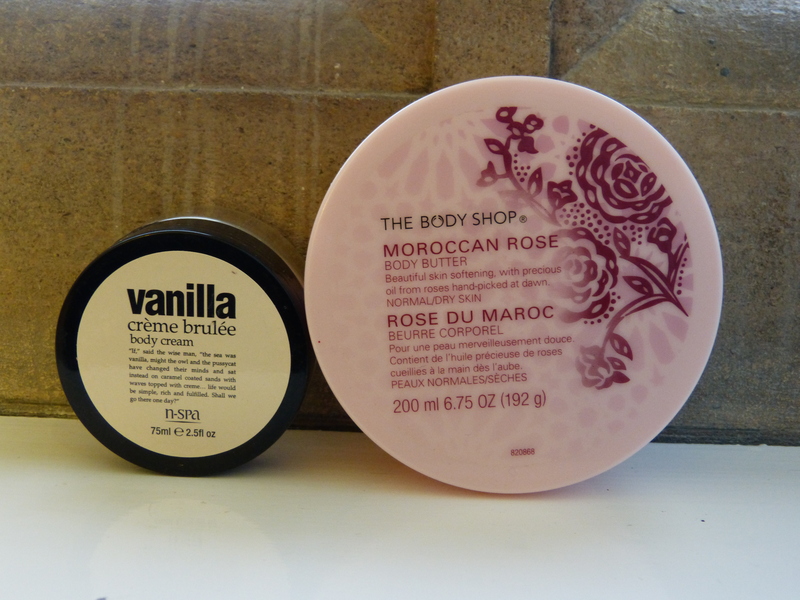 I like the new style creams a lot (see how much here), so I don’t need to hold on to these… And then one of my favourite moisturisers, The Body Shop body butter in Moroccan Rose. This was a really lovely rose scent, and although it was the lighter consistency of body butter, it was still really heavy-duty and I loved it! I loved this Natural Collection Wild Strawberry body cream a lot when I first used it, but I got really fed up, the more I used it, of waiting for it to sink in to my skin, so I probably wouldn’t choose it again. 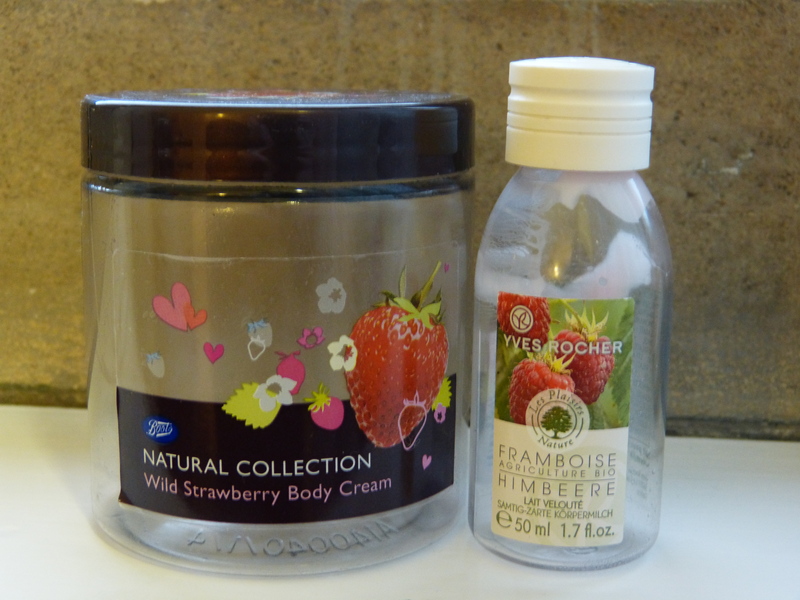 And even though I don’t normally like a body lotion, this Yves Rocher Raspberry body lotion really impressed me – it was nicely moisturising and sank in really well. 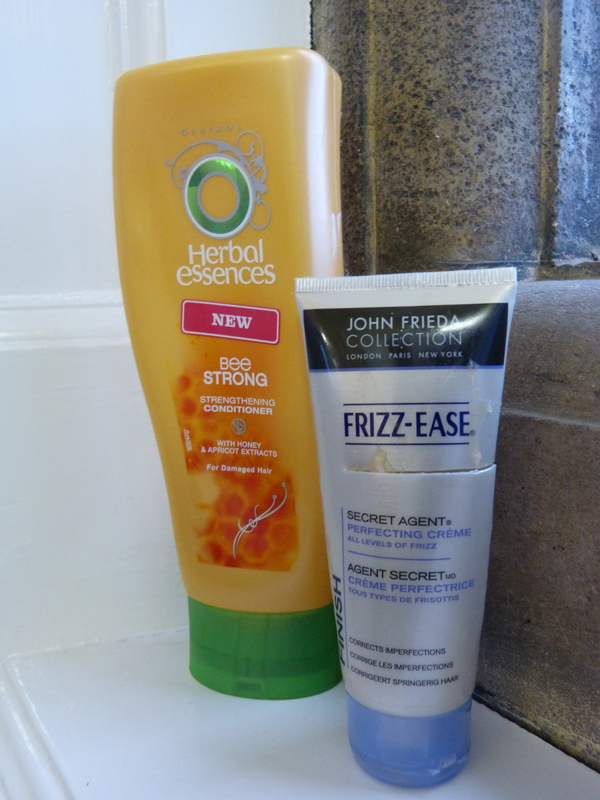 Only a little bit of haircare this month – my Herbal Essences Bee Strong conditioner, which I would be instantly repurchasing were it not for my conditioner stash. I really love this shampoo and conditioner, to the point where I’d probably call it my Holy Grail. I also finally finished up this Frizz Ease Secret Agent Perfecting Creme, which I have had for around six years! This is a nice de-frizzing cream, but I just found it really difficult to finish up, because you only need such a small amount at a time… I probably wouldn’t bother buying it again, as I have oils and serums I prefer to the heavier cream. Make up! 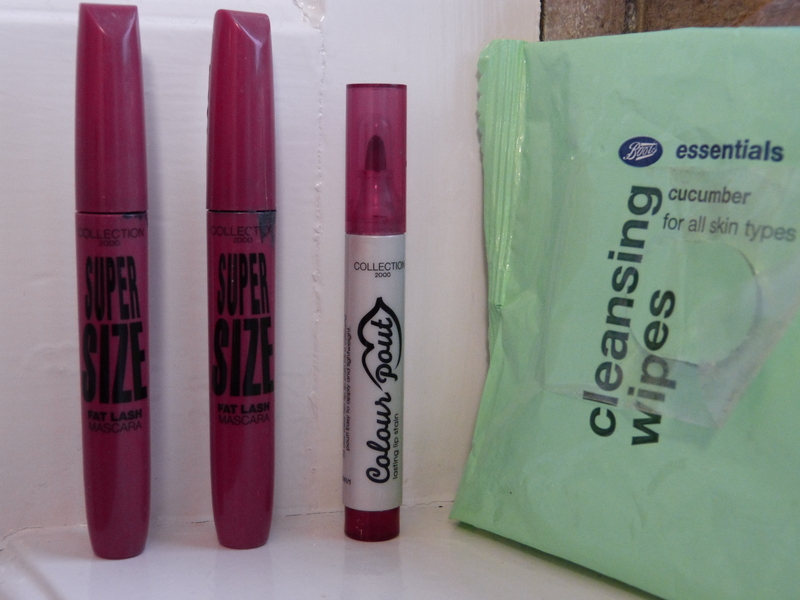 These two Collection Super Size Fat Lash mascaras are completely dried out, but they were very nice while they lasted (which was much longer than I was expecting). Quite impressive volume for such a cheap product! The Collection Colour Pout lip stain, was incredibly disappointing – a lovely colour, but it was very dry from the start, so it was very difficult to apply, and I just gave up. I also used up two packet of Boots Essentials Cucumber cleansing wipes, which are good for emergencies but no more special than any other wipes. And now some moisturising bric-a-brac. I finished up two lip balms this month! The little owl one was very sweet, but was such a sticky texture that I couldn’t wait to finish it up (I feel bad throwing it away though). I’m also a bit sad to see the back of my Nivea Soothe and Protect, which is the perfect basic lip balm: good texture, moisture, and size. I didn’t actually think that the Lush Skin’s Shangri La moisturiser was a good fit for my skin, but it would be a lovely moisturiser if your face needs something really very heavy. 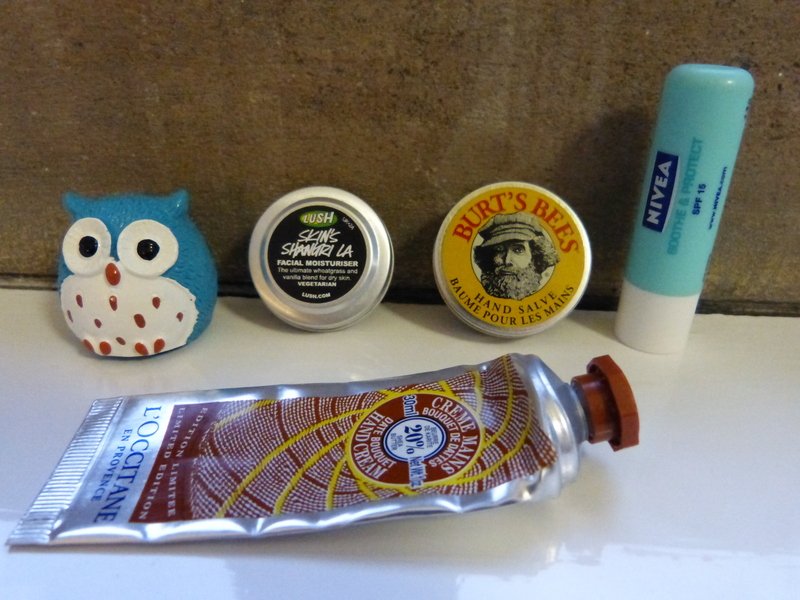 Similarly, the Burt’s Bees Hand Salve was too oily for my skin, but very dehydrated hands might love it. What did really work for me was the L’Occitane Shea Butter hand cream in Date Bouquet, which is one of my favourite hand creams, although I hated this scent. Loved the cream, hated my hands smelling all musty and fusty and horrible. And finally. I used up my little tub of Lush Silky Underwear dusting powder, which didn’t do much that ordinary talc doesn’t do, except that it smells really lovely- all soft and jasminey. I can’t see that I’d spend the money on this for myself, but it made a really nice present. I also love Ro’s Argan Body Conditioner, which is a wash-off in-shower moisturiser (I reviewed it here). I really enjoyed using this, but think I like the scent better than the effects, since I moisturise after the shower anyway, so I might not repurchase for a while now I have my Rose Jam shower gel! And that’s all my empties! It’s been a pretty busy month – are you impressed? What have you been using up in October? Link me to your empties posts! 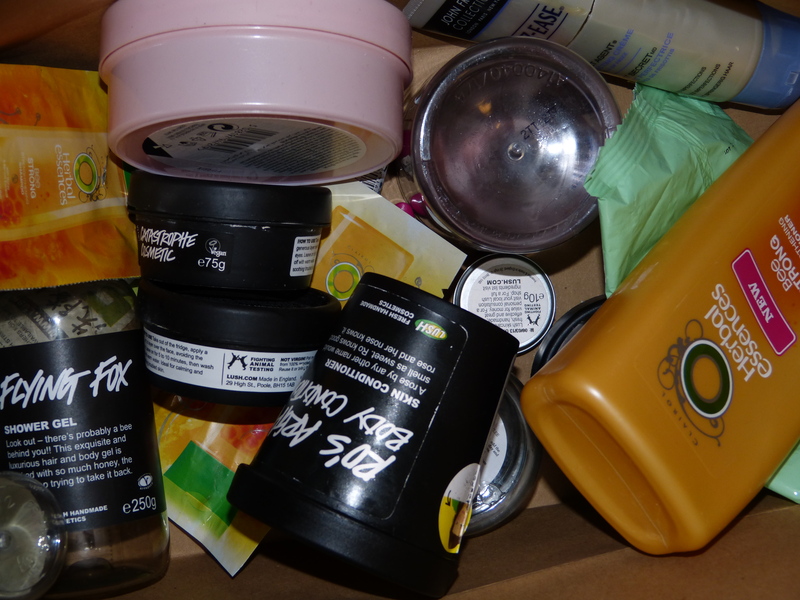 This entry was posted in Beauty and tagged beauty products, beauty review, body butter, empties, face masks, herbal essences, lush, lush cosmetics, moisturiser, Nivea, skincare, stash, the body shop, toiletries. Bookmark the permalink. I should really give Ro’s Argan a try soon; I had a small sample for the Nivea in-shower conditioner and actually really liked the concept! But then again, I also really like the smell of the (much cheaper 😉 ) Nivea version (it smells like old school Nivea from a blue tin – woooo! ).